Right?? They're bad, right? RIGHT?? Well, despite the screamers' best efforts to blame all the maladies of the world on this macronutrient, it turns out carbohydrates are good for you too (like a little fat, some vitamins and minerals, some protein...). The problem with carbohydrates is very similar to the fat problem. Different types of carbohydrates elicit very distinct effects in your body. Refined carbohydrates (i.e. grains mashed up by a machine and put into food that comes in packages like bread and crackers) work very differently from those found in true whole grains (i.e. the wheat berries you find in the bulk food section of your grocery store) which are both unique from the carbohydrates you find in fruit and vegetables (...yes, carbohydrates make up the majority of the nutrients in fruits and vegetables). However, in the end, all carbohydrates are broken down to three simples sugars by enzymes in your intestines - glucose, fructose, and galactose - which are then absorbed and sent to your organs for processing. These simple sugars (called monosaccharides) are either all eventually metabolized by your tissues to glucose in order to make ATP (energy), stored as glycogen in your liver or muscles (energy to use when you have low blood sugar or are exercising) or if they are present in excess, are turned into triglycerides and stored in your fat or muscle cells (bad). I'll talk about these individual sugars more in future posts, but for now I'm just going to focus on them as a group. There are important differences and sources of each and I promise to address them soon. Suffice it to say, at the end of the day, they all become glucose or fat. It really doesn't matter where you get them from. What DOES matter, however, is how FAST they get into your system and HOW MUCH you are eating (and WHEN you eat them, if you are a training athlete). An important thing to remember is that carbohydrate rich foods are necessary for healthy living. One of my favorite bloggers, Emily, over at SleepEatGymRepeat totally cracked me up the other day when she posted that Dr. Loren Cordain (the Paleo guy) wrote in his book, "Paleo for Athletes", that training athletes should eat very non-paleo BAGELS, PASTA, and SPORTS DRINKS immediately after working out. Her direct quote, "I FEEL LIKE I'M TAKING CRAZY PILLS!!??". 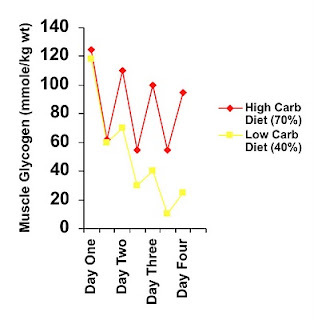 Well, not even THE Paleo guy can argue with decades of exercise physiology research that shows eating easily absorbed carbs after a long workout (>1hr) is necessary for replenishing glycogen in your muscles. If you don't replace the fuel your muscles use, you don't recover and you don't perform. It's that simple. Glucose makes up glycogen. No glucose, no glycogen. And maybe even more importantly, your BRAIN uses glucose EXCLUSIVELY as fuel. Yes, your brain can use ketones (a molecule that is chemically similar to glucose) as fuel, if you are STARVING. But it preferentially uses glucose. And not only as a fuel, but as a sensing molecule to tell it what is going on in the body in order to modulate circulating hormones. There are several places where you can get carbohydrates, and the sources of these sugars are really important. 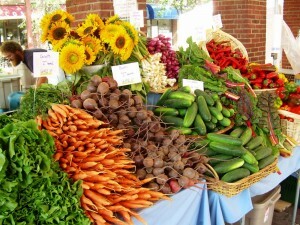 There are essentially 3 categories: Refined, Whole Grain, Fruits & Veggies. Multi-grain, sea salt, gluten free! Good for you right? Wrong. Anything that comes in a package - box, bag, bottle - is a REFINED carbohydrate. It has been manipulated by human hands into a new form. It does not matter if there is a huge label that reads "Whole Grain" or "All Natural" or "Organic". This type of carbohydrate is very easily digested by the enzymes in your intestine and that sugar gets sucked up readily into your system. A friend recently recommended that I read, "Wheat Belly" by Dr. William Davis, a cardiologist who rightly shows in his book that wheat bread is absorbed and spikes your blood sugar pretty much as high as white bread. I disagree with Davis' view on wheat as the culprit of all that is wrong with the world (but that too will have to wait for another post). However, he is very right that wheat bread and other products like it are detrimental to blood sugar homeostasis and lead to subsequent health issues. This REFINED carbohydrate is very strongly linked to diseases like Obesity, Type II Diabetes, Cardiovascular Disease, and potentially even some cancers. Unfortunately, this type of carbohydrate is what makes up the majority of the carbs we eat - boxed cereal, breads, pasta, crackers, energy bars, etc. 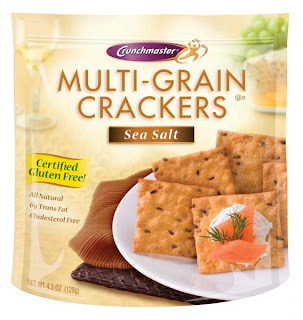 WHOLE GRAINS, on the other hand, come in a completely different kind of package. A package made my Mother Earth herself. These are grains that grow in the ground that go directly into your mouth. Their packaging is called FIBER (it's actually called "bran" on a kernel of the grain). Fiber is a substance that your small intestines cannot break down. There is no enzyme in the small intestine (that we know about) that can tear it apart to absorb it. Instead, fiber either travels through your intestines undigested OR becomes saturated with water and turns into a sort of gel that lines your intestinal wall. Either way, it drastically slows down the rate of absorption of the carbohydrates that it envelops. This keeps insulin levels low (insulin is necessary to transport the glucose into muscle and fat...low is good, but it is 100% necessary), keeps inflammation at bay (which is a precursor for atherosclerosis and heart disease), and decreases the total amount of carbohydrates that get into your blood stream overall (the gel acts like a barrier as the food travels through your intestine). The ratio of refined carbohydrates to whole grains has been shown to predict a persons susceptibility for obesity, Type II Diabetes and heart disease. The more whole grains, the less likely a person is to get sick. The whole grains also contain a little fatty center called the "germ" which is where all the vitamins and minerals live. Folate, the B's, and maybe most importantly, the major source of Vitamin E. No germ, no good stuff. Some great examples of WHOLE GRAINS are Wheat Berries, Brown Rice, Barley (not pearled), Rye, Oats (whole) and Quinoa. The important thing to remember is that whole grain products (like bread, crackers, and snacks) may contain remnants of the whole grain, but the outer fibrous covering (the bran) has most likely been cracked or smashed, allowing very easy access to the carbohydrate (endosperm) inside. This is why they spike blood sugar. (n.b. It should be noted that wheat products contain gluten, a protein that causes very real diseases like Celiac's and also affects a portion of the population with gluten sensitivity or allergy. This is a separate issue entirely from the carbohydrates contained in these grains and I will write about this protein in the future. Those with gluten sensitivities can still eat non-wheat whole grains and should also be very careful not to substitute wheat products with highly refined gluten-free products). Good Carbs from Fruits and Veggies! The last major sources of carbohydrates are FRUITS & VEGETABLES. The greatest thing about fruits and veggies are they are also loaded with fiber, not to mention essential vitamins and minerals. The sugar will be released slowly into your system and the total amount absorbed will be much less than alternative manufactured products. They are also much less calorically dense than their processed counterparts, so will fill you up with less chance of weight gain. You all know what fruits and veggies are so, I'm not going to make a list. But one of my favorite veggies is Swiss Chard, because it is so fibrous it makes me imagine that there are little green scrubbies cleaning away any crap from the inside of my intestines (...I have an active imagination...everything becomes a cartoon in my head...). So, at the end of the day, get as much of your carbohydrates from non-packaged sources as possible. Can you eat pasta? Sure, but only one or two times per week. Rather than just dumping some red sauce on top, make a healthy mixture with some broccoli, peppers, olives, EVOO and chicken (see how I worked in the veggies, good fat and protein there??). 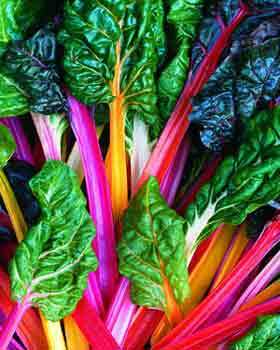 That way, you fill up on the nutrient dense components of the meal and eat less of the refined stuff. Better yet, make that dish with brown rice or quinoa...no refined anything! Pay attention to hidden sources of refined carbohydrates (sugar) as well. Yogurt, breakfast cereal, snack bars, and juice drinks are all PACKED with added sugar. 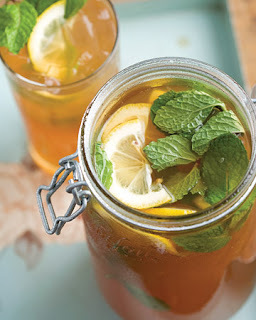 Get your iced tea un-sweetened with a little mint and a lemon twist (it's good...I swear! ), have plain greek yogurt with fruit and nuts for breakfast rather than the fruit-on-the-bottom variety, and snack on apple slices with natural peanut-butter rather than that 100 calorie snack pack. You'll be more full (because of the fiber), have increased your vitamin and mineral intake, decreased your blood sugar and insulin levels, and helped your risk for disease in the long run. It's hard to give up some of that go-to-stuff that makes life easier in the short run, but it's worth it in the end. Life is a (strong) process, after all. Newer PostOrganic Rest Stops? Summer Road Trip Hope!